Weaver Architects has developed the new offices of law enforcement technology firm Axon located in Seattle, Washington. Early on in the design process, the CEO came to us with an idea that became the driving focus of the project. The concept? To craft a porthole into the future of technology. The goal was to create the feeling of not walking into a corporate office, but instead, boarding a spacecraft that will transport one to unknown territories of time far ahead of us. With such an ambitious concept, the design of the client’s new home required inventive choices. The most noticeable is the first visible feature – the front door, which has been designed to resemble a spaceship hatch. When the heavy metal doors slide open, guests are greeted with an interactive panel to confirm their identity before entering. Employees utilize an iris scanner in order to gain access to their office. Another nod to the futuristic concept is the reception area, which was inspired by a “mission control” look and feel. Flat panel screens display company statistics and various images of space, to evoke the feeling of truly being off planet. Throughout the workspace, organic finishes were purposely left out in favor of strong sleek lines and polished metal materials that reflect light. The monochromatic finish choices emphasize the vivid lighting and strengthen the impact of the company’s signature gold graphics. To build such a unique space in standard office tower was certainly a challenge. 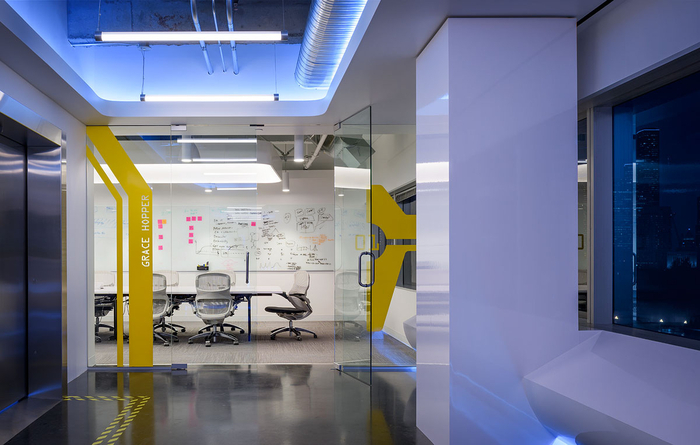 By utilizing dramatic lighting, a monochromatic color palette, and interactive technology, the end result was a workspace that inspires employees to think differently the moment they walk through the front door.